Charming Adobe Casita - Walk to Plaza & Canyon! Sunset House is the perfect house for you, family & friends to enjoy your Santa Fe vacation. It is a traditional adobe Santa Fe style with charming vigas throughout. It was recently renovated with 3 bedrooms and 3 bathrooms. The master suite has a king-sized bed with large entry / study room. The guest suite has 2 twin beds and a sofa bed. The junior bedroom has 2 twin beds. All the bedrooms are equipped with HD flat screen TVs and AC. There are three living spaces for entertaining and relaxing; and also lots of outdoor space to enjoy the turquoise skies of Santa Fe. Solid adobe construction, traditional details and a quaint and quiet neighborhood are everything that you are looking for to enjoy your vacation and create new memories with family & friends with fun, elegance and comfort! You also are going to love the location. It is an easy walk to the plaza (shops and restaurants) and Canyon Road (galleries galore). The plaza is 5-6 blocks and Canyon Road is 7 blocks away. It is also on the road to Santa Fe's best spa, 10,000 Waves (4 minute drive). The 'waves' is a world class Japanese style spa with hot tubs, excellent massages and lots of other treatments. We live in the same neighborhood and really love it. Quiet, convenient and safe. We would not live anywhere else. In total you can have 12 bedrooms. All houses are located on the same neighborhood. Please inquire. We are very excited to hearing from you! Thanks!!! Keywords: Traditional Charming Santa Fe Adobe Casita - your home in Santa Fe. Justin is an architect and Sandra is a marketing and operations professional. We live in Santa Fe and travel the world finding unique details to make our houses more special. We live in the same neighborhood (over 15 years) and are looking forward to hosting your Santa Fe vacation! You will have a great time! If you are planning on a trip to Santa Fe. Stay close to downtown, Santa Fe is very walkable. This house has a perfect location, just blocks from the Plaza and Canyon Road. Close to downtown, easy walk. Paper Towel, TP, Dishwasher detergent, Wash and Dryer Detergent and Softener, Hotel size soap to start your vacation. We had a wonderful weekend at the house. It is well appointed, comfy and cozy. It is in a great central location for exploring town, the art corridor, and hiking in the state park. We have been skiing in Santa Fe every year for almost 30 years. This house was the best of the best! Plenty of room and all areas are beautifully updated. All three baths are spa quality. The outdoor areas are beautiful and inviting. There was ample parking which is hard to come by in this location. The hosts were extremely helpful and professional. We really enjoyed this house! Owners were very responsive to any questions. Had a great stay at this adorable house. All upgraded and much better looking in person than photos! Only issue we had was heater problems which the owner responded to quickly but wasnt until the last night... otherwise we enjoyed our stay and would definitely return! Perfect location and great space for our family. We have been coming to Santa fe for the last 4 years and this is a great house to stay in. Location is perfect for a quick run up the mountain for skiing and just a few blocks from the plaza. House is better in person than in the photos and perfect layout for families and entertaining. Will definitely stay here again! Our family of five truly enjoyed our stay at the property. The property was conveniently located within a walking distance of the Plaza and was one block from Artist Road, which is the main road to the mountain for skiing. We were fortunate to get nearly 10 inches of snow on Christmas and the day after. This made it a bit tough to get out of the house but our host had crew drop by to clear the snow the same morning. We had three days of great skiing. We also enjoyed the layout of the house as it was setup well for my wife and I in the Master, our daughters in the second room, and my father in the third. Thanks to the snow, we spent lots of family time in the common areas enjoying the fire, watching bowl games and playing dominos. We also took advantage of the outdoor fire pit and sitting area at the house. We had two dogs with us on the property and they were well contained within the two fenced areas of the yard. The only minor issue we had was the ice maker was not working. We enjoyed our time at this property and would definitely come back. Lastly, we would suggest including some background/history on the house to the guest book. Thank you. 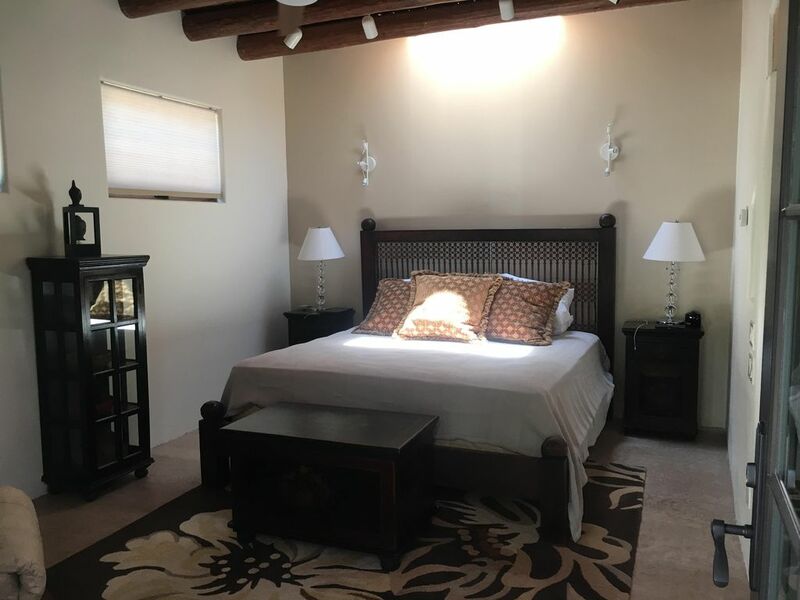 Low Season - $295/night - Mid Season - $350/night and High Season - $395/night Spring Break, Holidays, Santa Fe Special Events etc - different rates may apply. Rates vary according to season and length of stay, but are very reasonable. Please contact us with exact dates so we can provide the best rates. Promotional rates for stay over 5 nights. • Cleaning Fee: $150 (up to 4 people) Rates do not include Lodgers and GRtax (15.313%) Incredible last min rates - please inquire. Rates depend on the length of your stay.